In my experience, people say yes to too many things—we all do. Being a “Yes Man” or “Yes Woman” is something that is rewarded in our society—and yes, it is important to be a team player and share your gifts—but too often we don’t know where to draw the line, and we soon find that our own health and well-being has been compromised. Is this a challenge that you can relate to in your own life? The truth is: until you know what you really want to say yes to, you will continue to say yes to everything else. Not knowing what you want can cause you to experience inner doubt, to be torn between contradictory goals, to get distracted and scattered, to feel compromised, to be exhausted, to get into unhealthy sacrifice. Ultimately, the end result of this cycle is that you give your power away. So how can you get clear on what you want? How do you find your inner truth and reclaim your power? I want to share with you a practice Louise and I call My Affirmation Board. An affirmation board is a self-portrait. It’s a presentation of everything your entire being says yes to. If you are familiar with the notion of a “vision board,” it’s very similar but we want you to know that you don’t have to be limited to just images. The form of your affirmation board is entirely up to you, but here are some suggestions to get you started. Select a medium with which you are comfortable working. Much like a vision board, you might do a collage of hand-drawn images, or pictures cut out of magazines or printed off the Internet. If you want to travel more, find pictures of the location you have always wanted to visit. If you want to take care of your body more, find mouth-watering images of healthy foods that will honor your body like the temple it is. As you lay out your collage, be honest with yourself: what do you really want? You might prefer to do a written list. Write down everything that you love, that makes you happy, or something that you want to bring into your life. 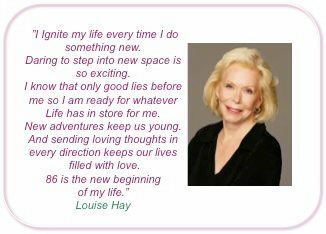 Louise and I have noticed that people’s first attempts at creating an affirmation board often focus on having and getting. We encourage you to make sure your Sacred Yesses are more than just a shopping list. You might include developing a quality like courage, gratitude, or forgiveness, for instance. Maybe you want to practice a skill like meditation, yoga, painting, or cooking. Maybe you’d like to do a mind map. There are wonderful examples of mind maps on Pinterest that you can browse for ideas. Ask yourself, “What do I want to learn?” and “What do I want to experience?” Include your favorite affirmation or a personal mantra, for instance. Whatever you do, keep it to one page. What Are Your Sacred Yesses? You create your affirmation board by listening within. You are listening for your Sacred Yesses. These Sacred Yesses belong to you. They’re not your parents’ yesses or your partner’s, your children’s, or anybody else’s. They‘re not about what you should do with your life; they are about following your joy. They affirm what you love, what you believe in, and what you cherish and value. They are about you living your truth. Find your Sacred Yesses, and you find your inner truth. The key is to express yourself, heart and soul. To focus on being rather than doing. Louise and I encourage you to give your affirmation board plenty of time. Express yourself. Be creative. Feel free to experiment. It’s not about getting it right. And it’s not about creating something that looks good. If you want, you can share your board with a coach or a trusted friend. It’s good to get feedback. Maybe they will point out something that you’ve missed. Finally, make sure that your affirmation board is about what you say yes to today—right now—not someday in the future. Remember, this isn’t about chasing happiness—it is about following your joy. As you get clearer about the Sacred Yesses of your life, you experience a sense of empowerment and grace that helps you to live a truly blessed life. When you forgive and let go, not only does a huge weight drop off your shoulders, but the doorway to your own self-love opens. I often ask clients, ”Would you rather be right or would you rather be happy?” We all have opinions on who was right and who was wrong according to our own perceptions, and we can all find ways to justify our feelings. Personal relationships always seem to be the first priority for so many of us. Unfortunately, hunting for love doesn’t always attract the right partner because our reasons for wanting love may be unclear. We think, Oh, if I only had someone who loved me, my life would be so much better.